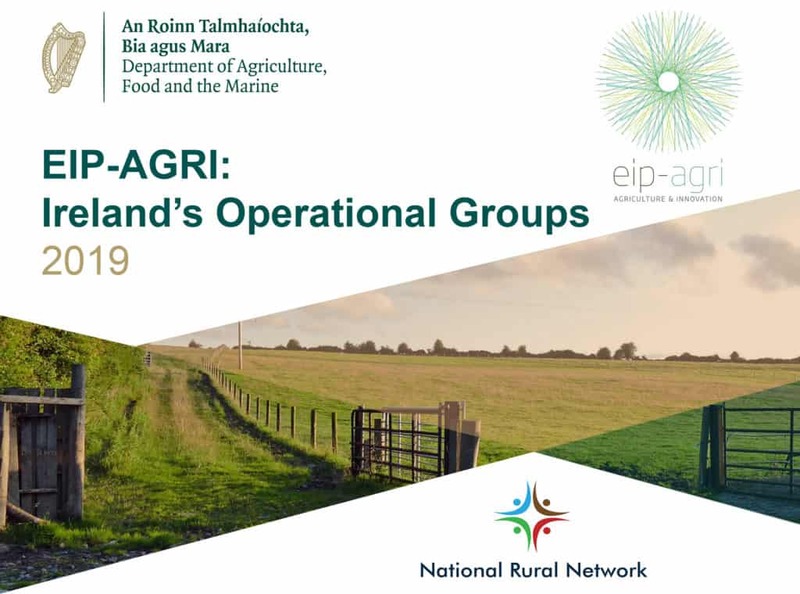 The National Rural Network team at NUI Galway have designed and produced a booklet entitled ‘EIP-AGRI: Ireland’s Operational Groups 2019’ to highlight and promote the 23 Irish EIP-AGRI Operational Groups selected by the Department of Agriculture, Food and the Marine. This booklet, aimed at inspiring people in the farming community and rural areas to maximize the success of the objectives set out in the RDP 2014-2020, details the main aims, objectives, activates and background of each of the successful EIP-AGRI projects. It was launched by Michael Creed, TD Minister for Agriculture, Food and the Marine on the 17th of April, 2019 in the Agriculture House, Dublin. The European Innovation Partnership for Agriculture Productivity and Sustainability (EIP-AGRI) was launched in 2012 to contribute to the EU’s ‘Europe 2020 Strategy’ of smart, sustainable and inclusive growth. EIP-AGRI projects are developed by Operational Groups which bring together actors such as farmers, researchers, advisors and agri-businesses to identify innovative solutions to particular challenges facing the agri-food sector and rural economy. In Ireland, EIP-AGRI projects are funded by the Department of Agriculture, Food and the Marine under the Rural Development Programme (RDP) 2014 – 2020. A budget of €59m is set aside for these projects. EIP-AGRI projects are developed by Operational Groups which bring together actors such as farmers, researchers, advisors and agri-businesses to identify innovative solutions to particular challenges facing the agri-food sector and rural economy. The 23 Irish EIP-AGRI Operational Groups align well with Ireland’s RDP and national priorities and will address challenges such as biodiversity, profitability and sustainability and will harness the creativity and resourcefulness which is the hallmark of Ireland’s rural sector. The majority of the projects are bottom-up, led by farmers who are passionate about the future of farming and the environment in their own communities. 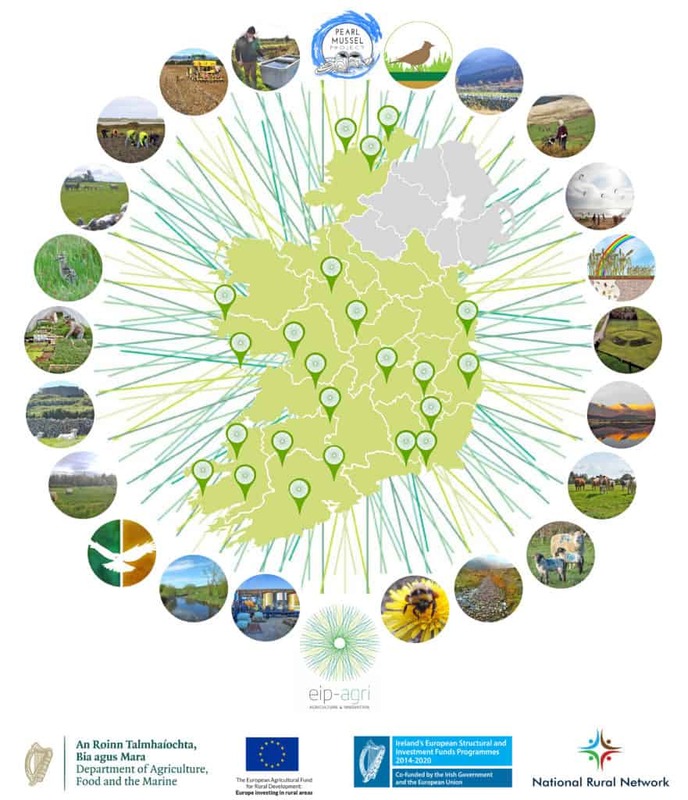 The National Rural Network have also created case study posters and an interactive database of all Irish EIP-AGRI projects to further disseminate and promote the Irish EIP-AGRI Operational Groups nationally and internationally. This information, graphically displayed on a Storyboard platform on the EIP-AGRI section of the NRN website, consists of a geographical map of Ireland combined with user-friendly interactivity and an infographic created for each project. This useful tool also includes links to the websites and social media accounts of the EIP-AGRI projects. The EIP-AGRI booklet and the interactive database have been designed and produced by Dr. Shane Conway, Dr. Maura Farrell and Dr. Aisling Murtagh who are based in the Discipline of Geography’s Rural Studies Research Cluster at NUI Galway on behalf of the Department of Agriculture, Food and the Marine and the National Rural Network. Abstracts of all 23 Irish EIP-AGRI Operational Group projects are also featured on the EIP-AGRI Service Point’s online EIP-AGRI project database and interactive European map. For more information on the EIP-AGRI initiative please email the DAFM EIP-AGRI division (eip@agriculture.gov.ie) and/or visit the EIP-AGRI section of the NRN website.